In working with clients, and at retreats, people often ask how they can find balance in their lives. Everyone seems to be more crunched for time, and have more that they want to do than ever before. I find that it’s easier to keep the “walls are closing in around me” feeling at bay if you slow down and work through these four steps to find balance in your life. When you’re looking to find balance in your life, it’s good to start out with stopping to really identify what “balance” means to you. When clients tell me that they wish they had “more balance,” they usually come to identify that they want to make time for something that is currently lacking in their life. They are often neglecting something that brings them peace or joy, or have been working longer than usual hours. Is it juggling everything that’s been assigned to me, along with all of the things I think I “should” be doing? Does it mean making more time for myself or family and friends? Is there something specific I’m yearning for in my life that is missing? What am I really saying when I say that I’m wishing I had more balance in my life? 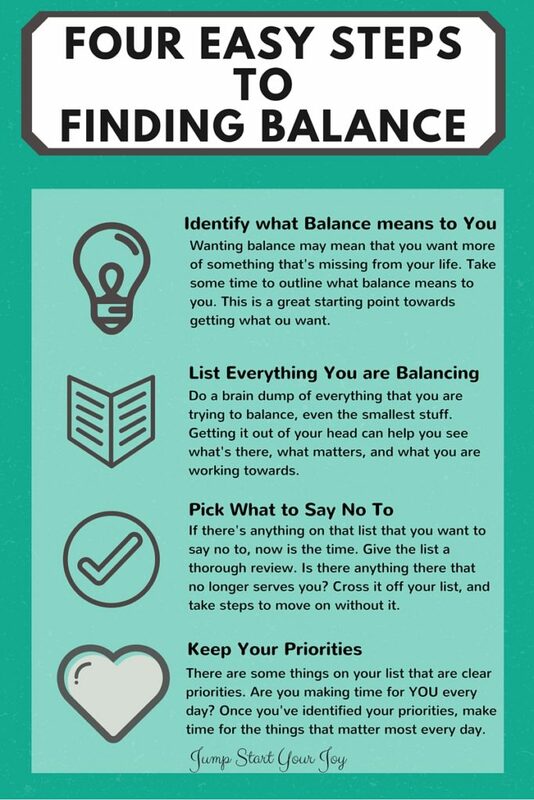 A pragmatic way to start wading through what balance means to you is to make a big list. Take a few minutes and do a brain dump of everything you have on your to do list (mental or otherwise). Add all the things and people that need your attention. Include obligations, things you need to do to pay bills, time for yourself, and all the things you love doing. As you spend time with the list, you may notice that there are some things that you’d like to stop doing. Or, if there’s something new you want to add to the list, you may need to say “no” to something you’re already doing to make space for for it. Take a good hard look at your list. What can you cross off? Are there some things that aren’t active projects, but are just sitting there, taking up space? Be as intentional and honest with yourself as possible about reviewing your list, and let go of what you can. In some situations, you may also need to give yourself permission to cross things off of your list. Saying no to things is hard; if (like me) you’ve been a people pleaser, or a Type A personality, this may feel very foreign to you. Acknowledge that it’s hard, but listen to your gut and your inner voice. If something or someone no longer serves you, or makes you feel “less than” who are, let it go. Your priorities will likely be easy to spot. Go for the gut check here. Sometimes it just takes really tuning in to what you want (instead of listening to what the rest of the world wants, or what you think you “should” want). Saying “yes” to some of the things you want, that you love, that light you up, may also feel like foreign terrain to some people. Maybe it’s hard for you to prioritize yourself. That is OK as well. Be gentle with yourself as you work on this list. Another great way to measure if something should be kept on your list, or even prioritized? If something or someone makes your heart soar, fills you with light, makes you feel more like you, then that is something or someone to hold on to. 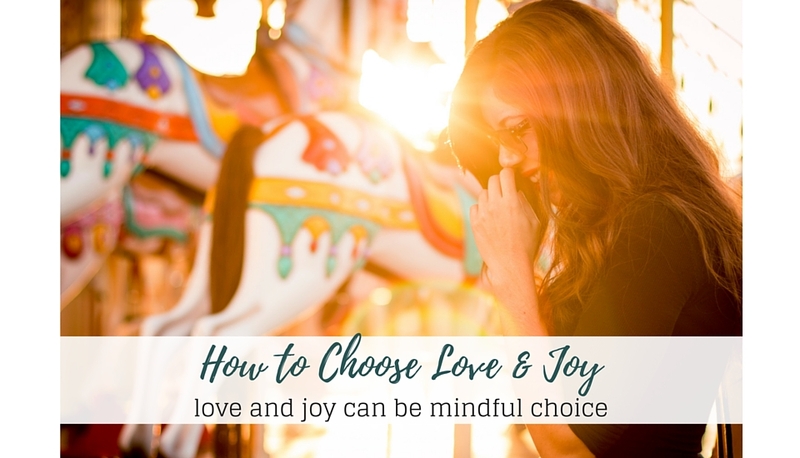 As with so many things in life, listen here to see if you are making a decision to keep something out of love? or are you letting fear have a hand in the decision? If it’s love, then you can feel really good about deciding to keep that as a priority. Once you have your list of priorities, and have identified what to say no to, it’s time to act. By following these four steps to find balance in your life: mindfully acting on what you want to keep, and what you want to let go of, you’ll have a feeling of great control, and more joy and satisfaction in the way you spend your time.